Liz and I were extremely saddened by the news of Peter Magowan’s passing Sunday. I will be forever deeply grateful to him for saving my San Francisco Giants from moving to Tampa in 1992! It was my privilege to first meet Peter at a company picnic for Safeway in 1989. I was working at Safeway corporate headquarters in Oakland as a IT software consultant at that time. Peter was serving employees hot dogs and hamburgers at the picnic and I enjoyed chatting with him briefly as he served up a hot dog to me … my choice of a hot dog was very fitting given our mutual love of baseball. We were in a cabin at Lake Winnipesaukee in New Hampshire in October 1992 when news broke of Peter’s group of investors saving of the Giants for San Francisco. It was early in the morning and I was watching ESPN while Lizzy was making breakfast. The memory is vivid now as the day it happened! I jumped up shrieking in sheer joy while raising my arms in celebration! Lizzy came over to me and we hugged tightly “I met him at Safeway in 1989! I LOVE you Peter Magowan!”, I yelled at the TV and Lizzy. Our New England trip ended in Cooperstown for my only visit to the baseball Hall of Fame. Peter’s last minute saving of my Giants certainly helped me enjoy my visit to baseball’s shrine as much as I’d always imagined it would. Thank you again Mr Magowan! The next time I saw Peter was in March 2000 two weeks before Pacific Bell Park opened. We were coming out of Bistro Jeanty after dinner. Lizzy said to me that a guy that looked like the Giants owner was walking into an art gallery beside the restaurant. I dashed after Peter in a manner that alarmed his wife, Debby, greatly. When Peter turned around when Debby warned him, I grabbed his hand and started shaking it vigorously. I told him I was a HUGE Giants fan, thanked him profusely, still pumping his hand too hard, for saving my Giants in 1992 I added that we were charter seat holders at the new ballpark. Peter didn’t know exactly how to take this large exuberant dude accosting him like that. When he recovered and I finally calmed down, he made a point of sincerely thanking us for our charter seat purchase. He added that the Giants couldn’t have built the ballpark without our support by buying charter licenses. I protested strongly that without his intervention in 1992 there would’ve been no charter seat licenses, a San Francisco Giants or a beautiful new ballpark! We ended by agreeing to wave to each other as our seats, thanks to our ticket partner Don O’Leary, are right behind the Giants dugout close to Peter’s seats beside the dugout. The first time I entered the beautiful ballpark that Peter and the other Giants owners had made possible I shed tears of joy! The setting, hard by the aptly named McCovey Cove, the giant old-fashioned glove in left field, the bullpens on the field, the irregular angles in right field and the intimate feel … now THIS was a BALLPARK! It still overwhelms me with emotion each time I enter our beautiful bayside ballpark. It concerns me that younger fans, that never experienced Candlestick Park, will begin to take this jewel of a ballpark for granted. As someone who suffered the cruel cold winds of Candlestick Park for 40 years and earned more than my share of Croix de Candlestick pins, I certainly never will take our BEAUTIFUL ballpark for granted! Without Peter Magowan this ballpark would never have come about. Thank you again Peter!! One thing that endeared Peter to me was his insistence of sitting by the field and not in a luxury box as most owners do. To me that demonstrates his love of baseball as a fan more than anything else. To this day, due in large part to Peter’s example, the Giants ownership group sits with the fans in regular, albeit primo, seats. In May 2004 I was in New Jersey taking part in training at the former Bell Labs campus in Piscataway New Jersey during the time the Giants were playing a three-game series with the Mets at Shea Stadium. Since the series was all night games, immediately after class let out I hopped in my rental car and fought the rush hour traffic to make the over 50 mile journey to the Shea Stadium to see my Giants. For the next ten years, before I was disabled by ALS and was unable to get to our normal seats, we saw Peter, Debby and the Magowan family at many Giants games at beautiful Pacific Bell Park. It turned out that the Magowan’s had four seats two rows directly in front of ours. Peter always was a gentleman and treated me especially nicely. Our deepest sympathies go out to the Magowan family. We will definitely make a donation to the Peter Magowan Fields for Kids Program of the Giants Community Fund. 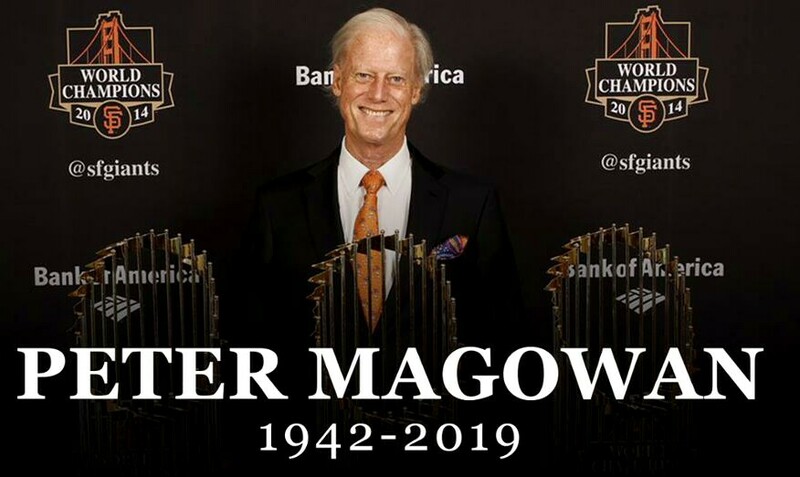 Peter Magowan gave San Francisco the gift of big league baseball for the foreseeable future. I will forever have great affection and admiration for Peter Magowan for saving MY Giants for San Francisco … and me!